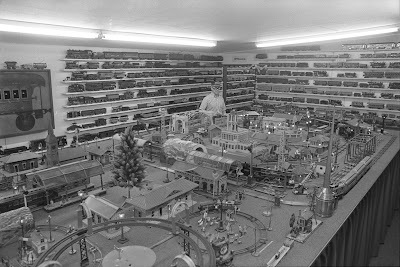 Ward Kimball in his train room, circa 1977, courtesy of the Los Angeles Times. CLICK to make this image huge. Thanks to an entry in one of my must-visit blogs, L.A. Observed, I found this great photo in UCLA's brand new online, searchable photo database. I am busy enough that I didn't have time to do anything more than the most cursory search--I actually found this photo of Ward by accident--so there must be plenty of other treasures there. Jenny...I just came across a post on my uncle, Roy McKie, from last year by your blog. He is 86 and lives in Ft Lee, NJ. He was, for many years, living in Manhattan and maintaining an office there as well. He still has 52 out of 63 books still in publication around the world. His bookm "My Book About Me" is still the best selling in his portfolio. He is in good health. He loved working with Suess (sometimes under Seuss' psuedonym, Theodore Geisal. He still misses Ted to this day. There is a corner of the Childrens Museum in Manhattan dedicated to Suess and my uncle is also recognized in that showing area. He comes back to Medford, Ma for Thanksgiving every year, his hometown 5 miles north of Boston. His son Todd and daughter in law Judy are very successful artists in Boston as well. Hello "anonymous"(you must tell me your name)! Thanks so much for posting. Wow--that's fantastic news about your uncle, that he's alive and well. Believe me,--and please do pass along to him--he has many, many fans among animation artists, including many at up at Pixar--really everyone who adores great graphic design and appealing characters. I am as you read a huge fan of his too, of course. I'd love to find out more about him, all about his career and art. Please do email me and let me know if it's possible to get in touch with him. If he'd agree I'd love to post an interview here on my blog. I know there's many thousands of readers past & present who'd love it, too. Let me know! And thanks again for posting! Those of us who were lucky enough to know Ward and spend time with him will always treasure those days. Lucky me. I even got to work with him. By the way, I've loved Roy McKie's work since I was a kid.